Optional Great Blue Hole & Lighthouse Reef – All Day Excursion: Includes 3 single tank boat dives and Blue Hole Park Fee. A perfect vacation getaway conveniently located within a stroll from the quaint town of San Pedro on Ambergris Caye, Belize.SunBreeze Hotel is the optimum hotel from which to explore the wonders of Belize. 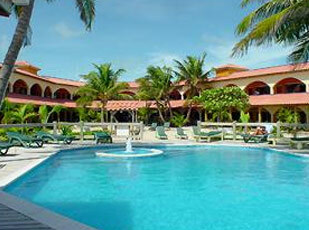 At the SunBreeze Hotel, the professional team can assist you in coordinating all your activities. Some activities include diving the famous Blue Hole, Turneffe, Lighthouse and Glovers Reef , snorkeling the latest phenomenon — shark & stingray alley, fishing or simply exploring the countless Mayan ruins, cave tubing, rainforest and reserves amongst many others all within a boat ride away from their pier. SunBreeze Hotel is a U Shaped Spanish Architectural design with a touch of the Caribbean surrounded by tropical gardens overlooking the Caribbean Sea. Centrally located at the immediate south side of the heart of the town with easy access to every means of entertainment and water sport activity; yet out of the hustle of the town.